So, at the end of the last post I was faced with a question—do I accept the results of the die roll and go with one mega-continent, or do I reroll/use fiat to divvy up the lands into more manageable chunks? 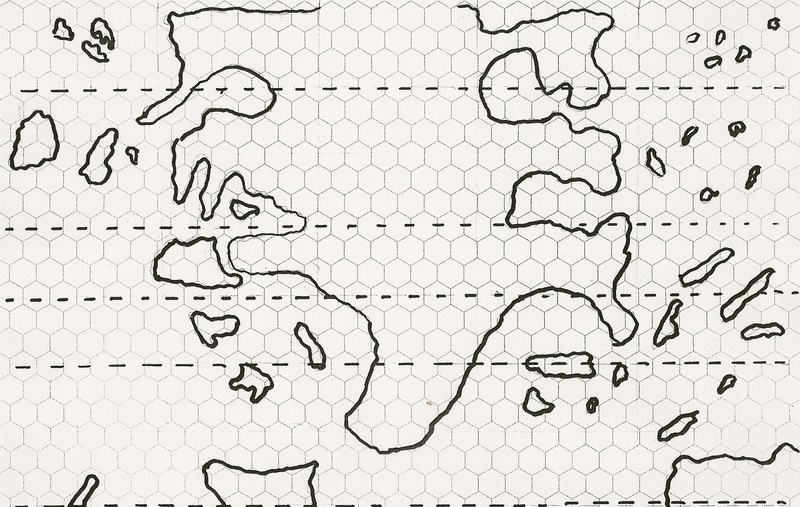 I’ve decided to go with the mega-continent idea. True, it limits the “New World” to a handful of isolated islands, but it’s also something slightly different than the norm. And, you know, dealing with dice means that sometime you are going to get unexpected results, and unless it’s totally out there, I generally like to go with them. Besides, one could argue that Europe/Asia/Africa constitute a “mega-continent,” so it’s not like there’s not plenty of room for wildly diverse cultures and terrains. I went over it with a Sharpie, so it’s a bit smoother than my first take with a pencil, but I need to some more work with this map before I finalize it. It’s nothing amazing, but a solid base to move forward with. Next, the World Builder’s Guidebook talks about plate tectonics and the like, but since we’re dealing with a flat world, I don’t really see plates being a factor here. Instead, I’m going to use the optional random method. After rolling on the table about 40 times (once to see if there are mountains in the region, once to see if there’s anything special or magical about them) it appears that the north is home to numerous extremely high mountain; in fact, my islands to the North East are “Extreme” –each one is an Everest size mountain, more or less. Def. a good location for Cloud Giants Castles and ancient wizard towers. Finally, we go to the climate. There’s no guarantee this planet functions like the Earth as far as temperature spread. I haven’t really given this much thought, I think I filed it under “as Earth-like as possible” but I figure I’ll roll the dice and see if anything inspires me. I get a 71—this is just at the cusp of the “Cold” element. “All climate bands are one step colder than usual. The poles are super-arctic.” This means that humans cannot survive the Polar Regions without magical protection. I’ll have to admit, I wasn’t prepared for this. I rather assumed that the roll would have come up “average” and the world would be usual. Then again, a cold and dark world, with people huddled close to the fires struggling to survive till spring does have a nice feel to it, especially since I was going for a Dark Ages vibe. So, I’m going to keep the result and see where it takes me. Alright, the Equator of this world would be sub-tropical, with the Tropic’s on this world being more of a Middle Latitude type environment, with large chunks of the north and south completely ice-bound. Given that, let’s move on to our seasonal variation—as a flat Earth, this has nothing to do with our Axial tile, but we’ll give it a whirl nonetheless. I get a 49, making us normal. Given that we are already significantly colder than Earth, this is probably for the best. I don’t want “wacky weather” to be a theme of the world. Next we’re going to zoom in one particular area and develop it in more detail. 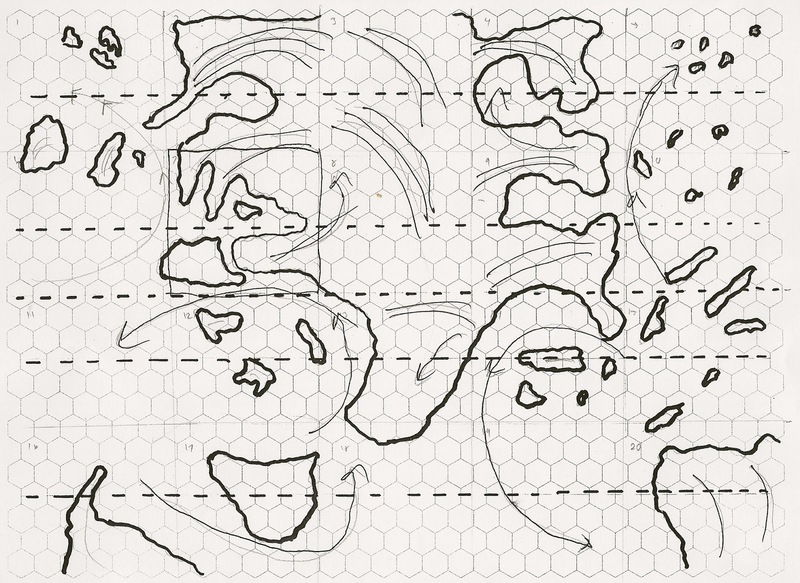 Below is the basic map I have with sketched out mountains, wind patterns, and currents. If you’ve got a flat world, I think you’re forgetting how much climatology gets thrown out the window. The North isn’t cold, necessarily… the ‘equator’ doesn’t exist, and wouldn’t be tropical; you need a source of water, or some way to explain why it doesn’t pour over the edge… are there seasons? Even day and night? Then I misinterpreted one comment you made, but I think it could lead to a terrific cosmology… you said “I get a 71—this is just at the cusp of the “Cold” element.”, and I thought at first you were describing an in-game Cold ‘node’. But that really works! So that’s one reason the North could be Cold… the Cold node is there! The Water node is in the middle of the ocean, and all water starts there and flows to the edges… the Heat node is in a small desert, but not far from the Water node, so there’s a tropical area… the Air node is near a major water edge, so although the current toward the edge is swift, usually ships can sail away instead of always getting sucked to their doom… the Earth node is volcanic… stuff like that. My first thought to explain the seasons was less to do with "nodes" as, I don't know, elemental gateways or something, and more to do with the gods. I haven't really put a lot of thought into the cosmology of this world yes--mainly because gods and cosmology is one of the last chapters in the WBG. But, I was thinking of going classicaly fantastic--maybe the sun really is pulled across the sky by a god in his chariot, maybe there really is a "North Wind"--an actualy deity who lives in a palace and sends out his daughters (who are the various winds) to send the cold air out into the world.